One hundred years ago they came. We reached out to them with a hand of friendship and they returned the gesture by nearly destroying us all. After a single encounter with the mysterious alien race identified only as Species 4876, the United Planetary Alliance was nearly decimated. Stopping their lone vessel was almost a hollow victory in the aftermath of the haunting mystery that Species 4876 presented: Where had they come from? Why did they attack us? And most of all, what if they came back? Today, the threat of Species 4876 is a distant memory, a nearly forgotten footnote in the history books. On the outer rim, cut off from any backup, ignored by Fleet Admiralty and surrounded by a hostile empire and an interstellar crime syndicate, Captain Mitchell and his crew of the USS Defiance find themselves as the first, and possibly only, defense against an alien menace that the rest of the galaxy has all but forgotten about. I'll probably do a longer essay about this, but in short, thanks to my dad, I grew up on a steady diet of Star Trek. It was a constant in our house. Family outings were coordinated around when a new episode of Next Gen would be airing and when the rerun would air. To this day I continue to love Star Trek. Anytime there's a new Star Trek movie or show it gets bumped to the top of the list for me. 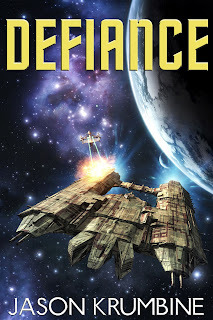 This book, Defiance, is the sum of everything I love about Star Trek. If you love Star Trek, I have a feeling you're going to like this book. Below I have a sample chapter. And remember, you can read the whole thing Sept 5th! “What’s the damage, Mr. Warrick?” Mitchell asked, stepping around exposed conduits that were pumping out plumes of smoke. There was a loud clanking sound followed by a stream of alien curses and then a short, stocky figure stepped out from behind open panels at the far end of the room. Jaxson Warrick was a short, flat faced man with a shiny bald head and an impressively thick, bushy beard. He walked with an almost imperceptible limp and made up for his lack of height with a wide barrel chest and arms so thick they threatened to burst free of his uniforms at any given moment. He had wide feet and a nose that had been broken so many times he couldn’t remember what it used to look like. “Cap’n,” he greeted Mitchell, wiping the grease from his meaty paws. In person his voice was even raspier than over the comm. There was something in the ship’s computer that automatically smoothed out the rougher patches of Warrick’s voice. It was a thick, heavy rasp that made every word out of his mouth sound like it was being weighed down by a ton of bricks. It gave the impression that speaking was a chore for him and people meeting him for the first time always expected him to speak slowly. But instead, Jaxson Warrick was one of the fastest, and most colorful, speakers on the Defiance. “Let’s go with the good news.” Mitchell followed him out of the room into main engineering. The ion engine pulsed a light blue in the center of engineering. Two twin cylinders, twice the width of Warrick himself, stretched out the from the ground level up to the top decks of engineering. There was a low, throttling hum from the engines that every new crewman described as a flat, uneven squeal that often gave them the sensation of being mildly seasick. However, after about a month, it would fade into the background of everyday life in engineering. When the drive was active and they were really pushing it, various crewmen had reported getting a weird achy feeling in their teeth whenever they stood too close to the engines. For Warrick, though, he didn’t even notice that. The ion drive and all its quirks and personality had faded into the background of his life. The only time he became aware of it was when it wasn’t there anymore and then, almost always, he found himself missing that achy feeling in the back of his teeth. It made for a disappointing shore leave. The two men ducked under the catwalk, avoiding a shower of sparks from the plasma welder above them. “Well, that walking carrot did a hell of a job keeping most of the fire off our cargo bays,” Warrick shouted to be heard over the loud repairs. “So the supplies?” Mitchell said. “Any more good news?” He followed Warrick up a narrow staircase to the second level of engineering. “Well, instead of telling me to patch it together on the fly, you should have given me the two weeks I asked for to do it right,” Warrick said. “Computer’s recording them as power surges. But those numbers can’t be right. That’s three times the output of the ion drive.” He pointed with his thumb over his shoulder at the twin cylinders.